Because why should consoles have all the fun? While console gamers have been enjoying the spoils of Rockstar's latest Grand Theft Auto installment, PC gamers remain benched on the sidelines - but maybe not for much longer. Eurogamer.net reported this week that several industry insiders claim Rockstar will unveil a PC version of Grand Theft Auto V sometime in the first quarter of 2014. Currently available only for the PlayStation 3 and Xbox 360, the latest title in the popular vehicular crime saga raked in an impressive $1 billion dollars (£627.7m, AU$1.056b) only three days after going on sale Sept. 17. Now the fifth chapter appears to be following the release pattern set by the previous Grand Theft Auto IV, which arrived on PCs eight months later than the console version back in 2008. Back in August, a Nvidia executive casually mentioned a PC version of GTA V during a financial call, a slip the graphics chip maker quickly backpedaled on. The latest report claims GTA V is now on deck for early next year, according to "multiple industry sources" apparently privy to the publisher's release plans. 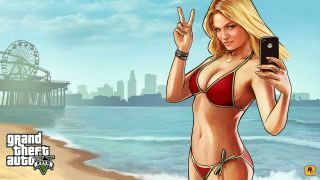 Last month, Take-Two Interactive called the console release of GTA V the fastest-selling "entertainment property ever," but that success hasn't pushed Rockstar to open up about a possible PC (or even next-gen console) version. "We don't have anything to share about the possibility of a next-gen or a PC platform release at this time and we are completely focused on delivering the best possible experience for the consoles people have right now," the company told website Newswire back in July. Dig into our extensive review of Apple's latest iOS 7!